Torontonians in particular are by now very familiar with the “Thirsty Pigs” court case whereby Van Boekel Farms pressed charges against Anita Krajnc. Dr. Krajnc, who is a principal activist behind the peaceful “Save“ vigils (Toronto Pig Save,Toronto Cow Save, Toronto Chicken Save), was charged under the Criminal Code with mischief under $5,000 for providing water to pigs in a truck en route to their slaughter at Fearman’s pig slaughterhouse in Burlington, Ontario. Leo Tostoy is widely known as a great writer, Mahatma Gandhi is widely known as a great freedom fighter, the only one so far who could inspire people for the non-violence fights and made them win. Little is known however about the connection between the two. Let me show you the missing link! A couple of years before the death of Leo Tostoy, there was a highly interesting letter exchange between the two, please read here. 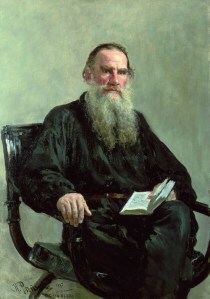 Gandhi mentioned several times in his life that Tolstoy was his true inspiration for the nonviolence fight. 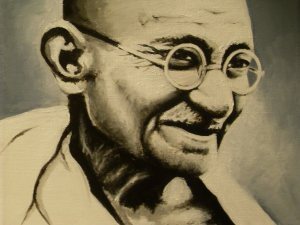 A detailed text on relationship between Tostoy and Gandhi is here. Please join our “Toronto Pig Save weekly vigils to bear witness events page on Facebook or alternatively click here to see our events calendar. Pig Save: Bearing Witness from Toronto Pig Save on Vimeo. • People To Know: Anita from Toronto Pig Save. 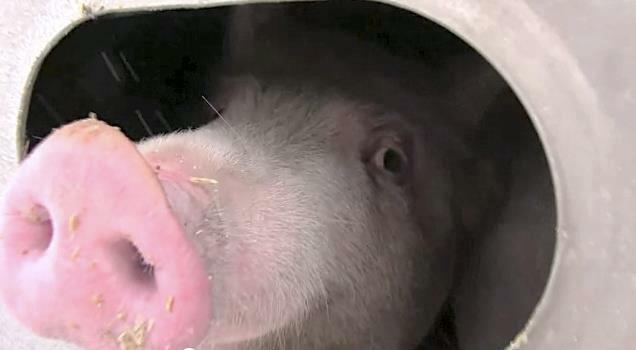 Jennifer Sorrell’s poetic blog at The Vegan Sprout about the Pig Save movement. Jenn adds photos worth a thousand words to illustrate the meaning and poignancy of bearing witness of pigs sent to slaughter in downtown Toronto. • From A to Vegan’s blog “Chalk Art and Bearing Witness,” by Mauro posted on May 23, 2013. Winter vigils to bear witness of pigs & vegan BLT giveaways — there is an alternative! and Toronto Pig Save’s Vegan BLT giveaway… ‘Tis the season of peace and love. Toronto Pig Save shared more than 50 vegan coconut bacon BTL’s with drivers (watch 3 min video), including a couple of pig transport truck drivers at our morning vigil on Tuesday, Dec. 18, 2012. The vegan BLT giveaway occured on a traffic island dubbed Pig Island at Lake Shore and Strachan in downtown Toronto — where the pig transport trucks pass in a busy intersection enroute to “”Quality Meat Packers” slaughterhouse was an exhilarating day, full of emotions. It’s the holiday season and we all acutely felt the sharp contrast of giving free vegan BLT sandwiches with love, kindness and smiles, on the one hand, and the sad and scared pigs in transport trucks, on the other. It’s why we’re out there… to spread the love-force or soul-force (as Tolstoy and Gandhi put it) and to save the pigs and our souls. The fab vegan coconut bacon which will soon save millions of lives once it gets into mainstream supermarkets and restaurants was made by the gentle soul Kristen Bethel of Know thy Food. We also gave gift packages with DVD of Peaceable Kingdom (film by James LaVeck and Jenny Stein featuring multiple generation dairy farmer turned vegan animal rights advocate Harold Brown) and packages of vegan bacon to two pig transport truck drivers and a third for Mr. Clair Schlegel–a Mennonite pig farmer via his cheerful driver. Come out and join us please at our weekly vigils by joining our “Weekly Vigils” facebook event page or emailing us at torontopigsave@gmail.com. It was so good to have everyone there collectively bearing witness and offering support and kindness to everyone: Paul Figueiras and Carlos Garcia for handing out vegan BLT’s, Jo-Anne McArthur, Julie O’Neill, Sylvia Fraser, Mary Fantaske, Rhiannon Arseneau, Brad, and Ian. Julie, who is pregnant and just came back from India volunteering with Animal Aid Unlimited helping rescued pigs such as Stacie, saw three sows in one transport truck. It’s the first time we saw sows. Again, the contrasts between the dirty, scared and abused sows heading to “Quality Meat Packers” slaughterhouse where they will experience electric prods, a carbon dioxide gas chamber, being hung upside down on one leg, bled with a hollow knife and thrown into a scalding tank after being used for 2 or 3 years impregnated 2x a year to “produce” piglets who are stolen from them in a couple of weeks vs. how all life and pregnancy ought to be treated… as sacred, special, joyful and wonderful. Pigs are treated with love and respect in sanctuaries across Ontario such as Ruby Ranch Pig Sanctuary, Snooters, Cedar Row, Wishing Well, Teja’s, RR Horse Refuge and others. See video “Introducing Stacey, our rescued paralysed pig at Animal Aid“, with whom Julie spent time with in India. Everything we do makes a difference from being vegan to spreading the word and taking part and supporting animal justice activism. Kindness defeats everything and can never be defeated. You can stand firm in a fight against everything except kindness. It is not the blaming of evil but the glorifying of goodness that creates harmony in our life. The most tender plants can push their way through the hardest rocks, and it is the same with kindness. Nothing can stop a truly kind and sincere person. The person does not exist to whom you cannot do good. The best and easiest way to thwart evil in this world is to respond to it with kind words, return an evil action with good.